and in the video below, where I also show a screen-shot. The audio of the video suggests it might be radar, rather than a receiver for telemetry. 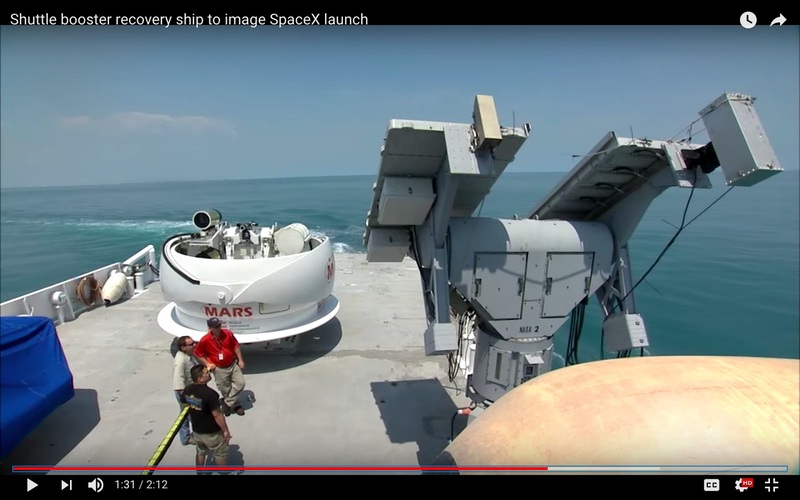 The ship in this video is NASA's recovery ship Freedom Star. This is both mentioned and seen in the video, and it is also identifiable by the fact that the MARS is on board. That said, the radar in question is clearly the Weibel Scientific Continuous Pulse Doppler X-band radar that Wikipedia mentions was mounted on the Liberty Star. The radar is easy to identify--you can see a picture of it being transported in this DVIDS article. According to NASA article "Shuttle launch imagery from land, air and water", the Weibel X-band radar was mounted on Liberty Star so that the ship could position it downrange of the launch site. It would work with another Weibel X-band radar on a ship south of the ground track to provide velocity and differential Shuttle/debris motion information. The DVIDS article mentions that the Brandy Station 2005 transporting the Weibel X-band radar "allows both NASA retrieval ships, Freedom Star and Liberty Star, to recover the boosters for refurbishing and reuse keeping the program as economical as possible." So it sounds like this is an instance where Wikipedia's knowledge may have been limited, and the Weibel X-band radar was, in fact, mounted on both recovery ships. Not the answer you're looking for? Browse other questions tagged identify-this-object tracking antenna or ask your own question.